Autotuning does not skip services in case that an active RF input is used. For this upgrade to take effect please re-install the TV by initiating Auto Start-up. 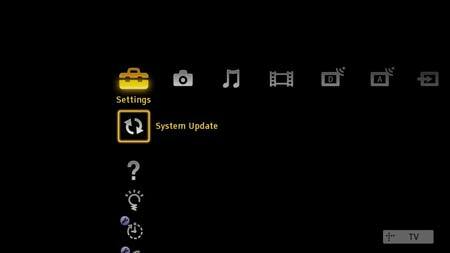 How can I check my TV firmware version? Power on the TV set and press the HOME button on the Remote Commander to display the Home Menu (XMB™). Navigate to the 'Set-up' category and press OK to select it. Navigate to 'Product Information' and select it. The version number is shown on the third line. Please read all the information carefully and thoroughly before downloading and installing any file. Failure to follow the instructions may cause the TV set to be unresponsive or to require repair. After you have accepted the disclaimer, save the update file to your computer Desktop. 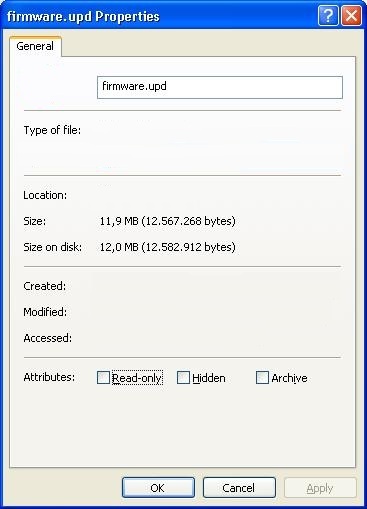 When the update download is complete, check that the file size is 12,567,268 bytes. Make sure that there is enough space on your USB device. The firmware update process may take up to 10 minutes. First read the whole procedure before starting to update the firmware of your TV set. Insert your USB device containing 'firmware.upd' into the USB slot located at the side of the TV set. The POWER indicator will be green for 30 seconds, followed by the PIC OFF/TIMER indicator slowly flashing amber, and the STANDBY indicator is red. After several minutes, the TV will turn off and then turn back on to complete the update. When the firmware update is completed, a message is displayed on the TV set for 5 seconds. If the version number shown on the third line is 1.752EA, your TV set has been correctly updated. "The system update failed" is displayed on the TV front panel display. Verify your USB device is in good working order and follow the download process again. Your TV set already has newer firmware installed.